Even the "gold standard" in cancer treatments is often toxic. Chemicals aimed at tumors also destroy healthy surrounding tissue and cause debilitating side-effects that leave families questioning the value of treatment. Researchers at Western University are among many looking for ways to offer hope to patients and their families. One promising area of research uses biodegradable polymers in a drug delivery system that more precisely targets cancer cells and selectively releases drugs to attack them. "To develop the system, we engineered the polymer into a deliverable form that's the right size and shape to circulate in the body, making it into a tiny nanoparticle that can be injected into the bloodstream," says Dr. Elizabeth Gillies, Associate Professor for Western's Departments of Chemistry and Chemical & Biochemical Engineering. 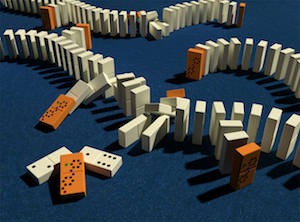 Dominoes illustrate the breakdown process of polymers that trigger a drug’s release at the right time and place. Image made by Andrew Wong. "It takes many actions to control the process and result in the drug's release at the right time and place," Gillies explains. "It's a bit like setting up and then triggering a row of dominoes with one touch rather than knocking down each individual domino." Drug delivery to cancer cells is just one application of the domino effect. The approach can also be used to direct oral medications safely through the stomach for release into the colon to treat Crohn's and colitis, for example. It's also being tested for tissue engineering, creating medical devices that, once implanted, replace or enhance tissue function that has been impaired by disease, injury or age. 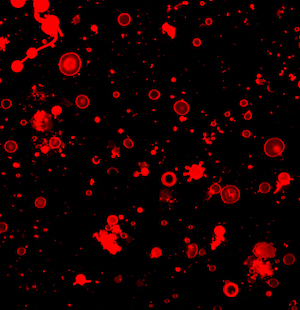 This microscopic image shows the membrane-enclosed sacs formed from polymers for transporting drugs. As a chemist, Gillies' approach is to look at a biomedical problem that requires a material, then design that material to carry out the functions needed. In the case of a delivery vehicle for cancer drugs, it should be stable when circulating through healthy tissue, but then release the drugs exactly when and where they are needed. Yet it has been difficult to control the timely and precise erosion (degradation) of the delivery vehicle. "It's not that easy to make something designed to quickly fall apart," Gillies says. A new type of polymer meets the requirements. When plugged with an end-cap, the polymer is stable and doesn’t degrade. Applying a trigger such as light, heat or changes in pH — the start of the domino effect — removes the end-cap and allows the polymer package to degrade, releasing the drug. The process is versatile. "It's a matter of saying 'we want to break down the polymer under these specific conditions' and matching an end-cap with the polymer," Gillies explains. "For example, a polymer sensitive to light would be triggered with sunlight or an ultraviolet light." Gillies' team is also collaborating with other groups at Western to use polymers as "scaffolds" for tissue engineering. These facilitate cell attachment without provoking an immune response, allow nutrients from the blood into the tissue and mimic its mechanical properties. A scaffold made of the polymer will degrade slowly and safely in the body, disappearing as the cells create their own structure. As an example, the polymer in the shape of a tube can be seeded with cells to grow artificial blood vessels. These can be used in patients that can't have bypass surgery or children who would outgrow a non-degradable graft. Where does the research go next? 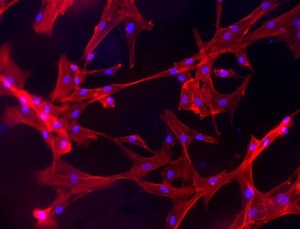 Smooth muscle cells grow on a biodegradable polymer, showing how the cells interact with the polymer surface. Gillies says the group is testing their approach on coated plant fertilizers, using a stable coating that degrades and releases the fertilizer only when plant growth signals that it's needed. "It should also be non-toxic to the environment and result in reduced pollution from fertilizer run-off," she says. "The particular polymer we're using is interesting because the degraded product can serve as food for plants and soil microbes. It should also be less toxic to humans and better tolerated than the products of many other polymers." Gillies' research is just one aspect of polymer-based nanomedicine, which has seen increased activity since the early 2000s. "There are gaps between how materials behave in the lab and in the body, so quite a few clinical trials are underway," Gillies says. "But we're making huge improvements in cancer treatments in particular, and there is a reason for people to be hopeful. In some ways, we're only scratching the surface of what can be done."